Colts tight ends coach Alfredo Roberts marvels at the innate skills Coby Fleener brings to the football field. Fleener stands 6’6” and has the abilities to run like a receiver. His position coach said when Fleener was consistent in 2012, he played at the ability you would expect a rookie tight end to be. So what is Roberts looking for out of Fleener in year two? 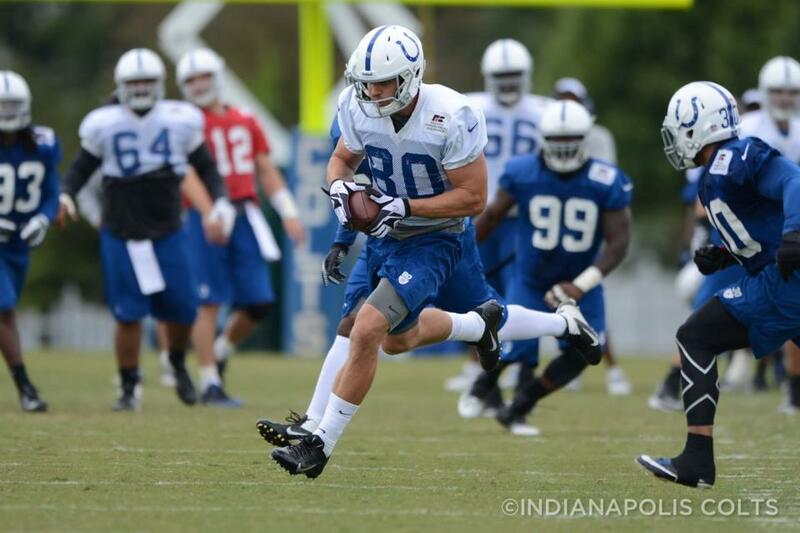 One area where Fleener will undoubtedly benefit from is playing in his tight end friendly, collegiate offense. Pep Hamilton’s affinity for utilizing the tight end position is well documented and Fleener should expect to see ample opportunities in the passing game in 2013. Roberts joked that he doesn’t think the tight end position can be used much more than how the Colts offense is incorporating the position. He points out Fleener’s success at Stanford, where the All-American tight end caught 10 touchdowns in his lone season in Hamilton’s offense. Now, Fleener is back in Anderson without having an offseason filled with academics, rookie obligations and a new offense. It’s a clearer mind for Fleener and he should reap the benefits out on the gridiron. “Pep (Hamilton) and I had success together at Stanford. Having as many tight ends on the field as we did out there, hopefully it will translate here as well,” Fleener said.